The first rocket-powered airplane was flown on June 11, 1928, at the Wasserkuppe, a popular gliding spot in the Rhön Mountains of Germany. Using two black-powder solid rockets fired in sequence, Fritz Stamer became the first rocketplane pilot in history. The rocket glider Ente was catapulted into the air from the 950-m mountain, and started its rocket motors with a pilot-activated electric switch. Two flights were made. The first time, the rockets were ignited in sequence, propelling the craft at least 1.2 km. On the second flight it was decided to start the rockets simultaneously, but this caused an explosion and set the wings on fire. From a height of 20 m, test pilot Stamer still managed to bring the craft to the ground and escape unharmed, but the rocketplane itself was a total loss. 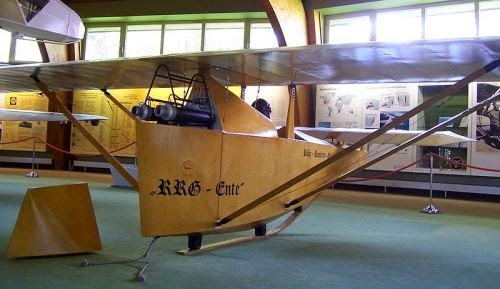 Little more than a year later, on September 30, 1929, Fritz von Opel flew a specially built rocket glider, the RAK. 1, before a crowd of onlookers near Frankfurtam- Main. The small craft was powered by a cluster of 16 solid rockets. He flew 1.5 km and made a hard landing that damaged the glider, but the flight again proved that rockets could propel a fixed-wing aircraft. The first liquid-propellant rocket-powered airplane flew on July 20, 1939, at the Peenemünde rocket range. It was the Heinkel He 176, piloted by Erich Warsitz, and used a Walter diluted hydrogen peroxide (H2 O2 ) and hydrazine-fueled engine. Prior to this, there had been numerous experiments with solid-propellant rocket-powered vehicles, both on land and in the air. But these could not be throttled or controlled. The He 176 was made of wood and weighed 900 kg empty, 1,620 kg loaded. It was 5.2 m long, spanned 5 m, and stood 1.5 m in height. 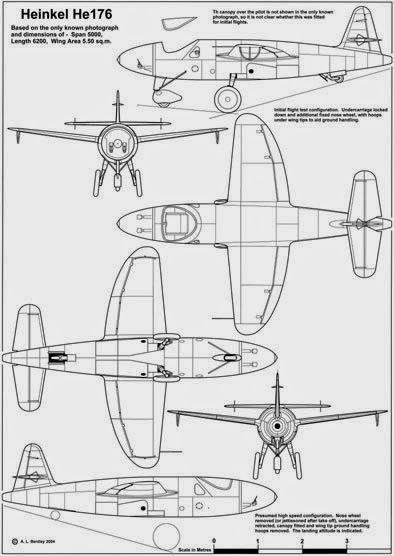 It had a powered endurance of only 50 s.
As is often the case, wartime accelerates the development of new technology, and World War II was no exception. For Germany, this took the form of the Messerschmitt Me 163 Komet, the first operational rocketplane in human history. Like its immediate predecessor the He 176, it used liquid propellants in a Walter rocket engine. The Me 163 set a world airspeed record in 1941 of 1004.5 km/h. The Komet played the role filled in later years by the surface-to-air missile. 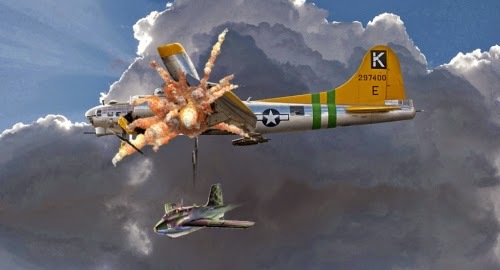 It would take off with the help of a wheeled dolly that remained on the ground, make a steep ascent to high altitude, and level off in preparation for a high-speed attack run on American or British bomber formations. Within 8 min, all propellants would be gone, turning the Komet into a glider. At this point, the pilot had to set up the correct glide path, find his home airfield, and land by means of a single tail wheel and extendable skid. As a combat aircraft, the Me 163 had the dubious distinction of killing more of its own pilots than the enemy, typically during landing. But as a rocketplane it earned its place in history. It was the first rocket-powered airplane to be used operationally, officially entering service for the Luftwaffe in 1944. Although other flying test beds had been fitted with rocket motors prior to the Me 163, this was the first time a rocket-powered aircraft had been designed for regular operational use.